Founded by scientists that think like creatives - we can integrate seamlessly with your current team. It's difficult to find good medical directors...especially ones that "get" creative and strategy. If you are lucky enough to have one, chances are they are either over- or underutilized on any given day. 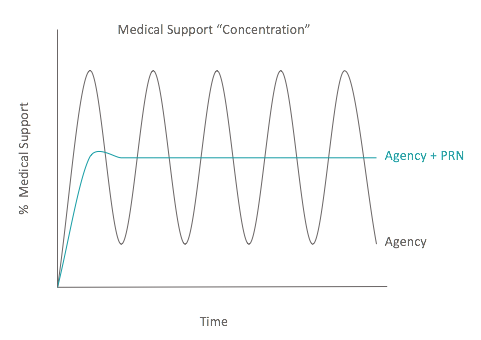 PRN EXPERTS can help smooth out the "peaks" and "valleys" of medical support and get your science to a "steady state". Geared towards agencies running without a full medical staff - we provide as needed support at any and all stages of a project lifecycle. From prepping the team on disease state and competitive to performing as part of the pitch team to driving existing brand work through the frustrating med-legal review process - we do it all. And since you can use us as much (or as little) as you need, you don't have to worry about the budget or HR constraints of a full medical hire. Our team is fully accredited, insured, and ready to work.